SOPLADORA DE NIEVE SIN ESCOBILLAS DE 20" Y 40 V está calificado 4.2 de 5 por 133. Calificado 5 de 5 por rdahm de Handled 12 inch wet snow! I purchased the Ryobi 40V snowblower from Home Depot (2 hour delivery!) the day prior to a 12 inch heavy snow. I had evaluated several other brands and choose the Ryobi after reading many reviews on all brands. After charging the batteries I was surprised at the performance of the Ryobi, moving heavy, wet snow. I have a 3-car driveway and was able to finish everything on one charge. If it handles wet snow easily when we receive the normal dry snow I could probably clear the driveway and sidewalks in less time than it took with the old gas-powered snowblower! Great product! 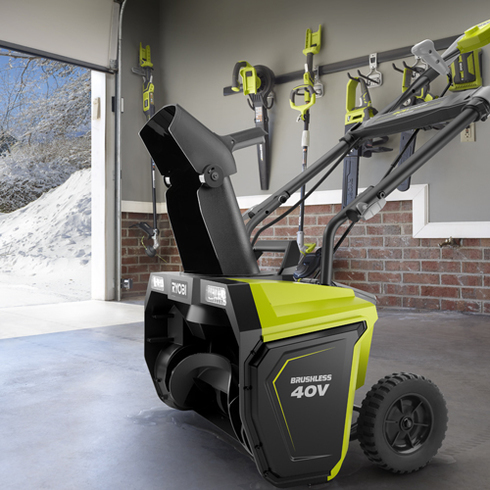 Looking forward to purchasing a Ryobi lawn mower in the Spring. Calificado 4 de 5 por Jimmy71 de Easy To Use Bought this in early November. Only had once chance to use it so far, only had one snowfall worth getting it out for. Seemed to work fine, on regular snow it blew it out pretty good, but if the snow was thicker/slushier, it was more difficult and had a tendency to clog up the chute. With December approaching, there will be more snow coming and I can't wait to give it some real work. Found it easy to use. Just slip that big battery into the terminal and push the button. Love the fact there is no oil or gas to worry about. I gave it 4 stars because of the limited use I had, but when the real stuff comes, it could go to 5 stars, but hopefully not less. Calificado 3 de 5 por eHac de Third 40v tool I own I own both the lawn mower and the tiller. Love them both. I was was deeply disappointed last year when the snow blowers were sold out so I anxiously anticipated their return this fall. Like others have said the snow blower struggles to sense the load against the motor and will either stall out or slow to a sputter. Oddly enough the 4ma battery that came with the tiller works wonderfully without issue handling 16” packs at the end of the driveway while the 5ma battery sputters even with 2” of fluff. My initial plan was to be able to swap batteries out and not have to stop and wait for recharges. Not the case so far. Calificado 5 de 5 por Garymacd de Wow! Just wow! Well, it finally snowed. I got this for Christmas and have been dying to use it. Finally, more than halfway through January it snowed. We’ve had about half the amount of snow fallen that is to be expected And it has blown and filled the driveway to about 15 cm. I was concerned about the power of a battery operated snowblower. I am not concerned anymore. It plowed through all the snow on my driveway and sidewalk with no trouble and then I still had power to clear out most of my neighbour’s double driveway. Wow! 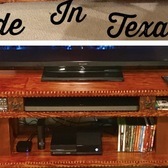 I am impressed! It is light, easily manoeuvered, incredibly quiet with easy to operate chute controls. I will reserve my opinions on the durability of the unit until next year. Best of all: no smelly gasoline, noise, pollution or carbon into the air. Calificado 5 de 5 por Extend4x4x4 de Long Overdue For years I've been mixing fuel, cleaning a carburetor and changing spark plugs. Then I had to pump the primer, set the choke and pull a rope until the old name brand snow blower fired up. With that, a puff of stinky smoke and a lot of noise. If I was lucky, I might finish without having to refuel and do it all again. Well no more. Now I take the battery outside and slip it into my Ryobi and go. And now I have a machine with headlights. No more fuel mixing, priming and choking, stink and noise are all things of the past. I got my snow thrower about 2 months ago. As most everyone knows, Michigan winters can be as bad as any as far as snow. This machine can actually take in more snow than my gas machine did and throw it farther so I can be finished faster. And with the short winter days, I can even do it in the dark. If only this had been available years ago. Calificado 5 de 5 por extend4x4 de Better than gas Got my new snow blower a few weeks ago and was waiting for the first snow. I've had a name brand gas/oil unit for several years. Between mixing, filling, choking and yank starting, I've had enough. The Ryobi 40 V electric eliminates all that. It's also just a little wider than that gas job. Even better, this thing has great headlights. No more mixing fuel, cuts a wider path, can see in the dark, no yank starting or choking. And it's very quiet. This machine has the best of everything. You can even cut through the snow and carry a second battery in the extra storage compartment. Now how smart is that? I doubt I'll need to use it since this 40 V system has a 5 amp hour rated battery. What used to take a tank of fuel I can do on a single charge. Calificado 2 de 5 por Kenr1978 de Underpowered Bought this before our snow middle November. Coming down at 30 or so degrees. First 2 inches or so during daylight was not bad. Not good neither. I thought it's first use. Well, daylight went and just a few degrees cooler and no way. It stopped completely when put into 3 inches of cooled of daytime snow. It had become to hard that fast. I can say also. The lawnmower was fantastic and was all that i hoped for. 18v system is a joy to use and remodeled complete insidemobile home I am very appreciative of the followup anx and the way they handled my case. I will be back for others. Calificado 5 de 5 por rdurrett de As advertised Bought it just in time for a big snow and it worked great. I already had the 40v mower so I did not need to purchase an extra battery. I was the envy of the neighborhood. Did my driveway and part of another before having to change battery. Much lighter and easier to use than a gas one and no smelly gas or exhaust. La sopladora de nieve sin cable de 20" y 40 V de Ryobi está diseñada para quitar la nieve rápidamente de patios, terrazas y entradas. Con un potente motor sin escobillas y la tecnología para detectar carga, esta sopladora de nieve RYOBI ajusta automáticamente la potencia para brindar un rendimiento óptimo. Este producto está diseñado para brindar potencia silenciosa y constante que descarga nieve con eficiencia hasta 25’. Esta sopladora de nieve inalámbrica RYOBI de 40 V y 20" cuenta con un botón pulsador de encendido y dos faros LED que hacen que limpiar la nueva sea una tarea fácil siempre. También tiene una tolva expulsora a 180° ofrece máximo control para sacar la nieve. 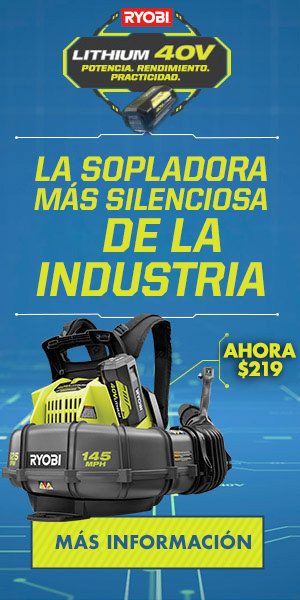 Para mayor comodidad, la sopladora de nieve Ryobi está equipada con una batería de alta capacidad de 40 V (iones de litio), 5 Ah, que proporciona un tiempo de funcionamiento prolongado. La sopladora de nieve inalámbrica RYOBI de 40 V y 20" tiene el respaldo de la garantía limitada RYOBI de 5 años y, seguramente, durará muchos años. Tamaño de las ruedas: 8"